Registration Day for All Boys & Girls from 6 to 14 is on Saturday 12th March and again on Saturday 19th March from 9 am to 11.30 am at Belmullet Golf Club. Annual Membership fee for 6 to 12 year olds is â¬50.00 & for 13 to 18 year olds is â¬105.00. PGA Professional Aidan Moran will be in attendance on Sat 12th March to provide coaching throughout the morning. Junior Boys Golf will continue each Sat from 12th March until late Oct and we look forward to seeing many new faces together with our regulars who have had great fun over the last few seasons learning how to play the game of Golf in a fun environment. Junior Girls coaching will also commence shortly when the Ladies have decided on a suitable date. Please note for Insurance purposes your Membership must be paid before you attend these sessions. All equipment will be provided for all ,free of charge. Medal Round Robin Matchplay. 4 groups with winner and runner up of each group qualifying for Quarter Finals. Open to all Junior and Juvenile Members with an official Club Handicap.Draw for groups will be held on Monday 21st July Please enter your name on sheet in the changing rooms if you wish to enter. Entry fee of â¬3.00 to be paid before playing first match. As a mark of respect to the Shevlin and Togher families following the tragic death of Jonathan Shevlin, the Junior and Juvenile sections of the the Lady Captains Prize has being postponed. Jonathan was a former Junior member of the Club. Coaching with Aidan continues this Wed 2nd July at 4.30 for Juveniles and 5.30 for Juniors and with Brendan on Sat at 9.30am to 11am. Please note, due to the Atlantic Coast Challenge, there will be no coaching next Wed 9th July. The final coaching session with Aidan will be on Wed 16th July after which there will be competitions for all Juv and Jun members on Thursday mornings at 9am.Progress made at coaching will determine which group each player will be placed in. We have two teams of three entered in the Kenny Cup Qualifying round to be played in Boyle on Fri 11th July Tee off time is at 2pm and 2.24pm . The six lowest handicap ( U17 at 1st Jan 2014) players available at the end of Teach John Joe sponsored Competition, to be played on Sunday 6th July, will be selected to represent the Club. Closing date for entries for the Connacht Junior Close Championships is this Friday 4th July. 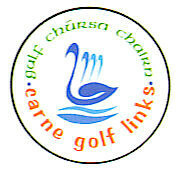 Qualifying round is on Wed 23rd July at Castledargan Golf Club. Before entering, please check with the Club Captain or Junior Convenor to confirm if is appropriate to do so.